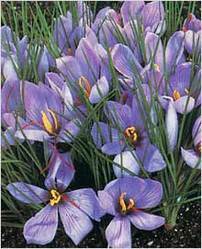 Common Name : Saffron, Autumn Crocus, Sapnish Saffron And Dyers Saffron. Uses : Saffron is anti-depressant, anodyne, antispasmodic, abortifacient, , carminative, diaphoretic, emmenagogue, expectorant, narcotic, nervine stimulant, stomachic and rejuvenative. It is useful in fever, cough, depression, enlargement of liver, flatulence, colic, insomnia and asthma. It is also useful in rheumatism, neuralgia, leucorrhoea, headache, sores, hemorrhoids and snakebite. It is used as a flavouring and yellow coloring for various foods such as bread, soups, sauces, rice and puddings. It is widely used in cosmetics, especially in fairness creams.